"These, Ladies and Gentlemen, are the nation's Mercury Astronauts." Fifty Years ago, American received seven extraordinary men with a press conference just a year after the creation of NASA. The announcement came at a pivotal time in spaceflight history, and unlike the Russian Space Program, which kept their Cosmonauts identities a secret, NASA started off their program with much press and public interest. 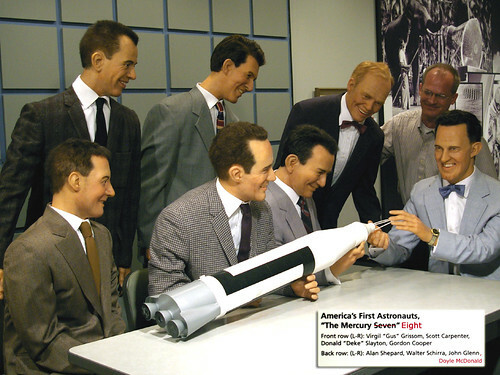 The seven men, Scott Carpenter, Gordo Cooper, John Glenn, Gus Grissom, Wally Schirra, Alan Shepherd, and Deke Slayton, were turned into instant celebrities. Spaceflight was perceived very differently at that point. For this announcement, nobody knew if it was even possible to send a person to space. The Mercury Program was designed to see if mankind could survive the journey into space and return safely, part of a larger agenda to bring the United States to the Moon, as outlined a couple years later by President John F. Kennedy. Each of these pilots were graduates of Navel Test Pilot School, and underwent rigorous tests to reach the Press Conference. Of the original 69 who applied to the program, only the seven made it through. 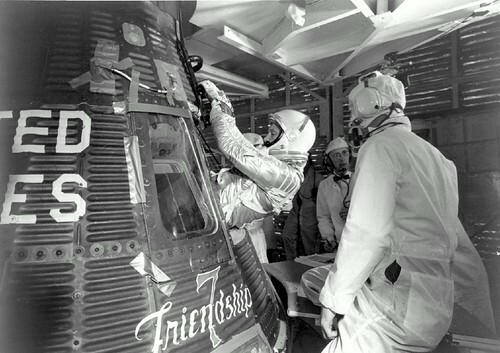 Six would fly the Mercury missions, before the program was phased out to the Gemini Program, which was designed to see if humans could build hardware that would work in space, and to see if we could live for longer durations. Apollo, the third program, would utilize the experience and knowledge gained during the prior two programs to reach and explore the surface of the moon, which was accomplished ten years later, in 1969 by Buzz Aldrin and Neil Armstrong. In January of 1961, Alan Sheperd became the first American into space, just weeks after Cosmonaut Yuri Gagarin accomplished the same feat. He would later go on to command the Apollo 14 mission, and would walk on the moon. The other six astronauts would reach space, although Deke Slayton would only take part in the Apollo-Soyuz mission more than a decade later, grounded because of a heart problem. The seven men are sadly underrepresented and rather unknown when it comes to World and American History - people tend to only remember Neil Armstrong, and while his accomplishments are nothing short of incredible, these men did more. They showed humanity that our long-held dreams of reaching space were not only possible, they were dreams that were reachable, and that we would return to the edge of our world time and time again. Like explorers of old, they broke barriers and ventured into the unknown to discover something new, to prove that there were no boundaries that could hold back humanity and that we would touch the sky. You can see the original press conference here, here and here.